To be a good runner you need to have running specific mobility, running specific strength, and running specific endurance. The biomechanics of running require your pelvis to twist in one direction and your trunk to twist in the other direction. It is not just a forward and backward movement of the legs, there is a lot of rotation going on. If you look at someone running from above you will see the huge amount of twist at the pelvis and the trunk. The motion at the pelvis is driven by the foot moving forwards so we need to consider how the hips and pelvis are functioning. Are they mobile and strong and do they have endurance? The motion at the trunk is driven by the arms moving forwards so we need to consider how the thoracic spine is functioning. Is it mobile and strong and does it have endurance? And of course because the first thing to hit the floor each time you take a step is the foot, we need to consider how the foot and ankle are functioning. Are they mobile and strong and do they have endurance? If we want more endurance for running, we need more mobility and strength. If you work to improve your mobility but you don’t have strength through the new range of movement, your body will take the mobility away again because you won’t have the control needed to maintain it. The body interprets uncontrolled mobility as instability and instability is risky for the body. This is why stability and strength are so closely related, and why you can’t work on mobility without working on strength. And not just mobility and strength but also endurance. They all play into one another to make running sustainable for longer. 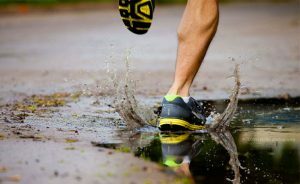 The biomechanics of running are universal although the degrees of movement in each direction vary depending on the structure of your unique body. This basically dictates how your body moves when you run. Each body is different so some will have good thoracic and ankle mobility but poor hip mobility, therefore they would get the most improvement in their running by working on their hip mobility, strength, and endurance. The alternative approach to running training involves working on your weakest link. This way you will get the most out of your training.